World renowned climate "experts", such as Al Gore and Obama, claim that global warming in the U.S. is causing more severe weather events. In fact, just the opposite has occurred in 2012, which NOAA confirms. 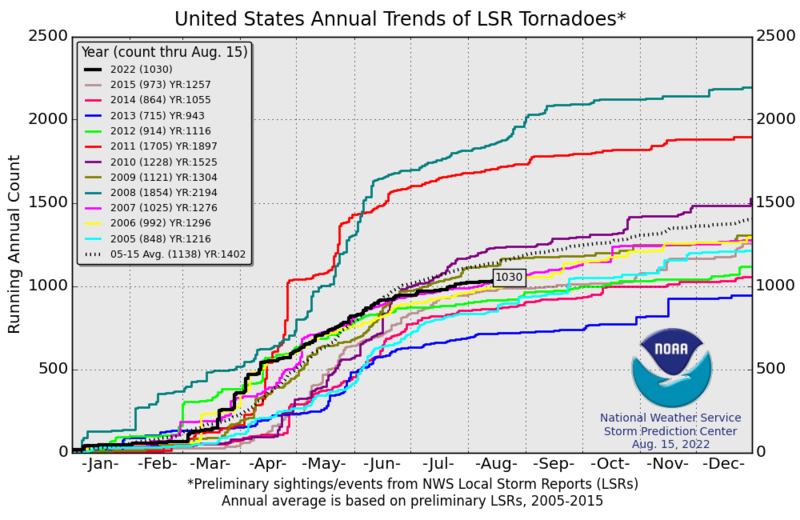 As the U.S. has experienced a very warm year compared to previous recent years, the tornado count reported has declined by over 50% from the really cold year of 2008. And as historical evidence has substantiated, cold weather (colder climate) generates more frequent and stronger severe weather events than a warmer climate. Of course, the likes of Gore and the anti-science Obama never mention the very warm climate that Mexico has and the resulting massive number of tornadoes that occur there - ooops....oh that's right, a warm Mexico doesn't have many tornadoes. Update: The above NCDC chart is a plot of Y-T-D (Jan-Oct) temperatures over the last 15 years, through October 2012.